It was fourteen years ago today that our nation suffered a great catastrophe. 9/11 stirred our souls and changed our lives forever. It was one month after that horrific day that I was an invited guest artist at Wichita State University. My dear friend and colleague, Nick Johnson, was then, and is still Chair of the dance department there. His lovely wife, Sabrina, is on the faculty and they both teach the most extraordinary classes, and choreograph very intelligent and creatively-thought-provoking work. I landed there knowing that I needed to address my feelings about those awful events that had just taken place, just one month prior. I guess I could’ve choreographed a simple, dancey-dance to something light and airy to off-set my heavy emotions, but instead, I wrestled with the the event head-on, and and used my guest artist time as therapy to choreograph a piece that I titled, “Unthinkable Equation.” Not exactly Martha Graham’s “Dances After Catastrophe” from “Chronicle,” but similar intention. Nick and Sabrina told me one morning while I was staying with them, that I had been screaming at the top of my lungs in the middle of the night. I hadn’t recalled much, but what that did tell me, is that I must’ve been suffering PTSD. It was after my residency, however, that something wonderful occurred. Sabrina and the students presented to me this Capezio box containing what would become my motivating dance shoes for years to come: Cheetahs! They became my non-red, Red Shoes. Remember the The Red Shoes? You can google it. These became my favorite pair of jazz shoes to date, my Cheetahs… and sad to say, it’s time to retire them. 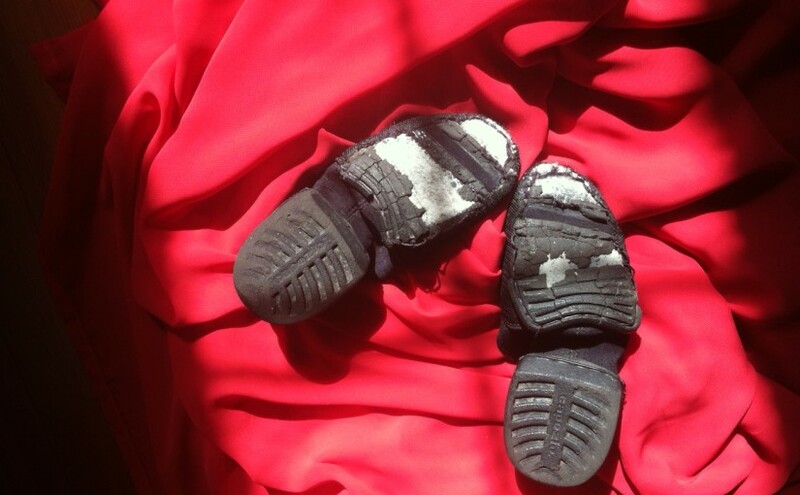 The black rubber soles are flaking off on every studio floor I dance on, leaving pieces of rubber behind, as if tiny pieces of a dance I had been choreographing had been lost to those chunks of Cheetah goodness–those magic shoes helped mold numerous artistic undertakings, and held such sentimental value for me. Of course, these shoes have become obsolete, as does most great dance attire and footwear in the dance world. They had a cool split-sole, and they made my pointe look better than what it is. My barre work excelled with my Cheetahs, and I was excited to create new dances with my happy, pointed feet! However, as the soles broke off, and I found myself cleaning up after my mess in studios far and wide, I finally had to make the decision to let them go. The broken sole disintegration seemed symbolic in part, as I wondered if parts of myself were flaking off along with the rubber. It’s been a summer of letting go and taking time for rest, renewal and inward reflection. It began with saying goodbye to dancer, Ryan Schmidt, as the sun set in NYC on a hot, sticky day. James Pierce, longtime friend and dancer of ACD, joined us as we toasted her new home near Chicago, where her husband landed a new job. My heart was heavy that day. Though so elated for her, it felt like yet another piece of that black sole falling off. She was, and is a gem that brought so many vital contributions to ACD. As she continues to dance and perform in an aerial company, I’ll dream of her touching down in NYC again to dazzle me with her amazing talent. Letting go IS hard… it often finds us looking back, which clearly I’ve been doing. I googled my first dance teacher, Hedy Tower, the other day, to see if she was still alive. I came to find out that she passed away three years ago. I felt remiss in not getting back in touch with her after all of these years. I learned that she had been teaching up until the age of 99! What the what?? I was five when I first started dancing with her in Jenkintown, PA. I was terrified when she beat her gong and made us act out being witches. I remember having to put a fake wart on my face and wear a black dress and tall, pointy hat, as we did our first public performance at my grade school. Of course, later in life, I had an a-ha moment, as I sat in my first dance history class learning about German dance pioneer, Mary Wigman, and her famous “Witch Dance,” and how that dance resembled what I had learned when I was five. Oh THAT’S what Hedy was making us do! Though shocking to my system at such a young age, it was Hedy that taught us to “let go” of our fears and to risk making a fool of ourselves… she impressed that it’ll be good for you. Summer 2015… more letting go. No witches in site, but lots of old stuff to toss out, not just shoes, but old tapes, and not just the ones in my head. VHS tapes. Digitizing is time consuming and yet necessary this day and age to preserve those antiquated tapes. I have much transferring to do, all in an effort to save my vintage work before it ends up like my broken rubber soles. The humidity can ruin VHS tapes so fast, and so time is not on my side with this job. Letting go of the old technology has not been easy. If it were up to me, I’d still be cooking food in the toaster oven, and turning the knob right on the TV to change channels. I like buttons, knobs and switches. I abhor touch screens. There’s so much room for error, and I’m sure you can agree that there’s more malfunctioning going on now than in the past. Ok, so more letting go. Looking back at my old jazz class pedagogy this summer, it dawned on me that the material really needed to be passed on. Let go of that, too. Like my fist dance teacher teaching me the “Witch Dance,” I wanted to pass on a tradition of jazz dance that could be archived with a suitable and trusted dance enthusiast. After a briefing with my ‘daughta from anothah motha’ and beautiful dancer, Annie Heinemann, we decided to book studio time and revisit the hour-long warm-up I created back in 2006 for my students at WMU. We broke it all down, and got most of it back, with a few holes here and there. My last stint with my Cheetahs was with Annie. We chuckled as we watched the shedding rubber pieces fall onto the studio floor! Passing down this warm-up class to her has been a fun and rewarding process. She is a skillful teacher, and has it all together as a dancer… among other works, you’ve seen her in “A Dress in the Stream.” With a few more rehearsals, and a few changes here and there, I think we’ll get it back. The mix of the old theater-dance style, with contemporary modern, should get her students at Greenwich Academy working hard, and hopefully they will come to appreciate the heritage of the jazz dance… sooner than their first dance history class — fingers crossed. So, with time to ruminate on my many walks this summer on the beach, I finally made the decision to let goof that old rubber-90s website, and start anew. Dumping pages and ideas that no longer were relevant was humbling, and yet encouraging. Taking stock of what was good, and throwing out the rest has been a daunting task after nearly thirty-years of making work. OMG!! I visited Tucson this summer and went back to my alma mater. Yep, it was 29 years ago I started graduate school. My soles were fresh and raring to go then. I started right in on choreography and somehow, never let go of it. With so many years, so many tales, so many dances, so many dancers, and so much time, energy, and not to mention MONEY, I still am finding within my soul, a place that holds sacred those creative urges. Those old, broken pieces of sole are thrown away, but the memories of those times past will forever be imprinted upon my soul. And from this day forward, it won’t be the same, but I’m sure I’ll still somehow get to the pointe! Oh, and please don’t forget to revisit the Beatles, Rubber Sole. One of my favs– I’ll never let go of that one! Stay tuned for my new website!